Gnocchi (pronounced NYO-kee) are fluffy, Italian-style dumplings made of potatoes and flour. 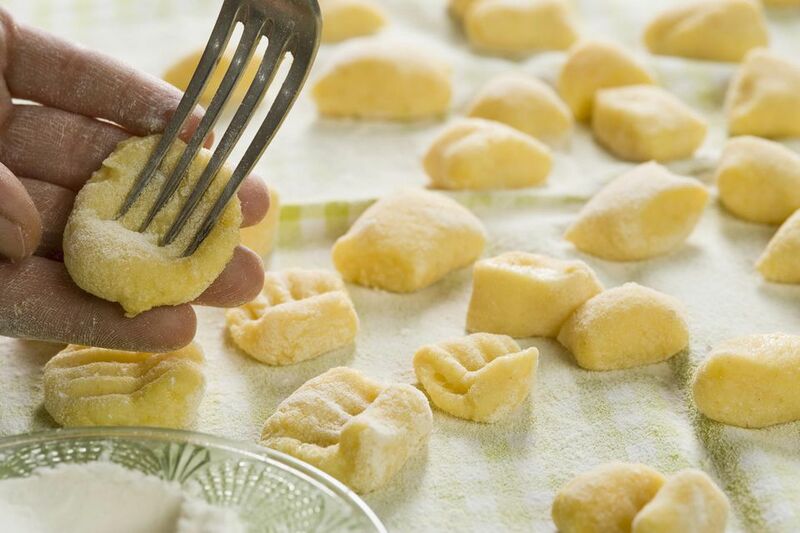 While they originated in Northern Italy, where potatoes grow well in the cooler climate, varieties of gnocchi are found in almost every region of the country. The word gnocchi is believed to derive from the Italian word nocca which translates as "knuckles", not surprisingly. Every area of Italy has its own version of the dish. With their little nooks and crannies, they absorb sauces well. Gnocchi can be served simply, with melted butter and grated Parmesan cheese, or in a more complex preparation such as tomato sauce, basil, and mozzarella. Steam the potatoes in a large soup pot with a steamer insert, or steam basket, for 30 to 40 minutes or until they can be pierced with a knife. Pass the cooked potatoes through a food mill or potato ricer. This method is preferable to mashing them by hand as it achieves a smooth, uniform texture. Avoid putting the potatoes in a food processor as this will make them too gummy. Turn out the cooked potato mixture onto a lightly floured surface, and add about half the flour. Knead until you have a sticky mass and keep adding flour a little at a time until the dough is smooth. You won't necessarily use all the flour. Cut the dough into smaller sections, and roll each piece into a long cylinder about ½ of an inch in diameter. Then cut each cylinder into individual pieces about ¾ of an inch in length. Fill a large pot with water and generously salt the water with a good handful of Kosher salt. Bring to a boil. When the water comes to a boil, drop the gnocchi into the water. In about two minutes, the gnocchi will float to the surface of the water. Let them cook about fifteen seconds more and then skim them out with a slotted spoon. Drain the gnocchi well and serve immediately topped with a basic tomato sauce and grated Parmesan cheese, or with any of your favorite pasta sauces or these sauces for gnocchi. Note: You can boil the potatoes for gnocchi if you don't have a steamer basket or colander. But if you do, boil them whole, and leave the peels on so that they don't absorb a lot of water. Too much water will make the gnocchi gummy rather than fluffy. Once the potatoes are cooked, let them cool just long enough that you can handle them, and then peel and proceed with Step 2 above.